Need help setting up your Interactive Video? Interactive Video lets you upload a video and add practice questions or comments to it. Practice questions help you and students gauge their comprehension of the video contents. 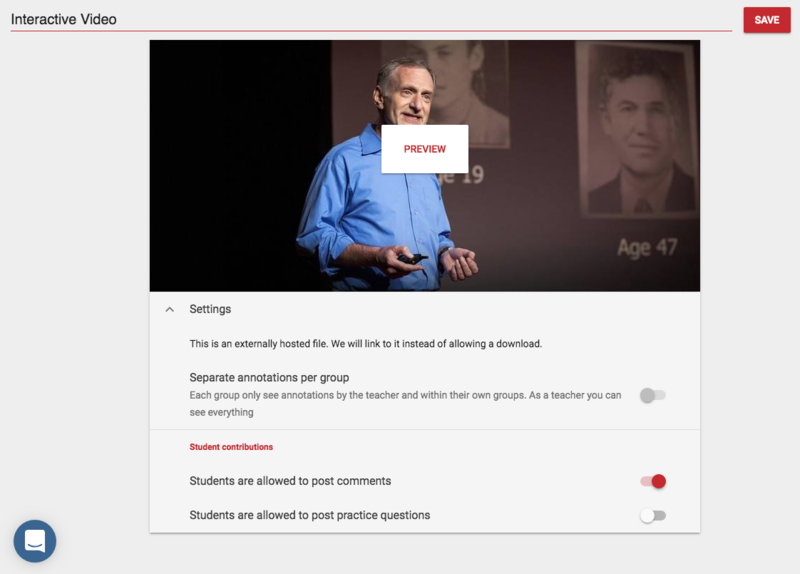 Furthermore, questions and comments can help guide students to the most important arguments in the video, or jump start online discussions about its contents so that students are better prepared for class. When you create a new Interactive Video, you see the following screen. Fill out a title. Read more on changing the name of the assignment in your LMS or in FeedbackFruits. To upload a video, drag and drop your desired video, or click choose video to search for it on your computer. If your desired video can be found online, copy and paste the link in the paste link field. Click use copy of existing to select a previous Interactive Video assignment of you or one of your colleagues. A copy of this existing assignment will be made, copying all teacher contributions (comments, questions, instructions). Student contributions are not copied. After you've uploaded the video, you can click preview. This can be useful if you need to check if you uploaded the correct video. You cannot add questions or comments in the preview, you must publish the video before you can do so. Click settings to expand the settings field. Here you can enable the copyright protected material option. Enabling this option stops students from downloading the video. If you disable this option, students will see a download button, which allows them download the original video. The screenshot above shows an example of an externally hosted file: the video was copy pasted from the internet. In this case a download is not possible, however students can be redirected to the originating source. Let your students discuss the material in smaller groups! Or make the video accessible per class instead of publishing it to all students in the course. First, you have to define the groups you want to use in the LMS. See this article on how to select the appropriate groups for your Interactive Video. When using groups, students only see the annotations of students within their group. As a teacher you can filter on annotations per group, or see all annotations of all students in the assignment. In the Overall Student Progress overview, you will see metrics per group. You can also enable the option that lets students post practice questions (disabled by default). Having students ask and answer their own and their peers' questions can be a valuable learning experience, but is not always desired. Finally, you disable the option that lets students add comments to the document (enabled by default). Comments can stimulate interactivity with the study material, but is not always desired. Click the red + button to add instructions to the assignment. If you add an instruction module, scroll back up to write your instructions (see screenshot below for an example). 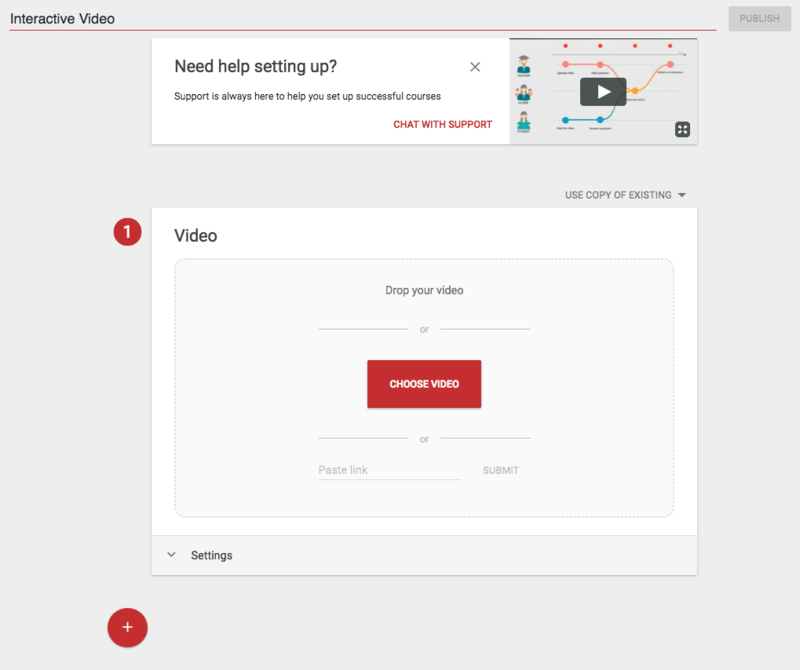 When you have uploaded a video, given it a title, specified your setting and have written your (optional) instructions, click publish in the top-right corner of the screen. Click change file if you wish to replace the video with a different one. 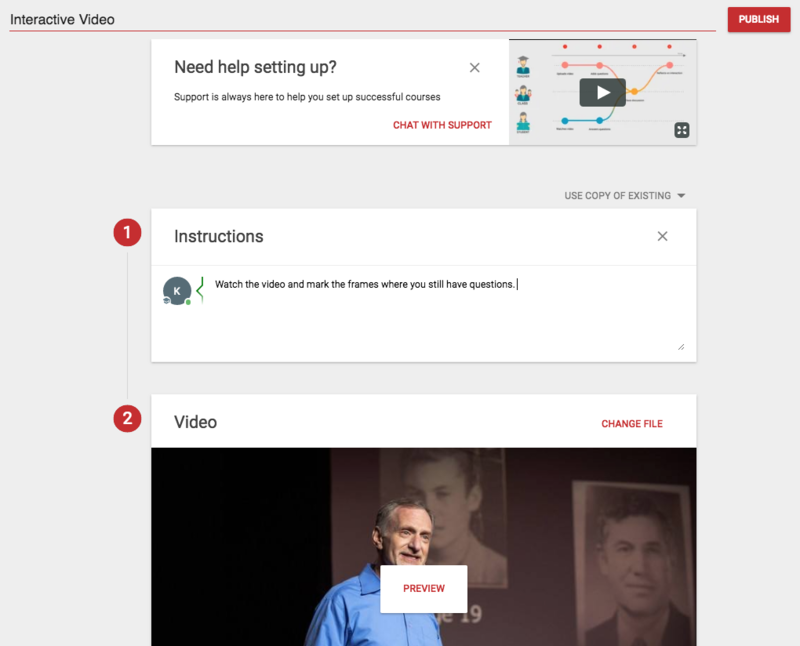 After you publish the video, you can click the three dots in the top-right corner of the screen to edit the assignment (change the file, edit the instructions, enable/disable students downloading the video, adding practice questions and/or comments). Here you can also download the original video, without comments/practice questions. When you have published your video, click Start watching to open it and add practice questions and/or comments. Select the right timeframe in the video to link a practice question or comment to this specific part. If you want to add an overall question or comment you use the '+= button in the lower right corner. Practice questions are inline practice moments for students and can be added by the teacher as well as by students when enabled. Comments can be questions or discussion points and can be added by the teacher as well as by students when enabled. Add comments if you want inline discussions in the video: students are able to respond on each others comments. Click here for how to add a comment or practice question. You have now finished setting up your Interactive Video.